Hanford St. Gallery is very sorry to announce that we have had to cancel our 2014 show schedule. The recurrence of effects from an old injury makes it difficult to give the gallery the effort and attention the artist’s work deserves. We very much appreciate our artist’s willingness to show with us and regret that we cannot continue; but, retiring from the field seems the better part of valor. We will remain open thru late January, Thu/Fri/Sat, from Noon to 5pm with all remaining art on sale at 25% off and good prices on office/art supplies and furnishings. The gallery space will be available for rent soon. The many new friends we have made these last three years have been a delight and we are very grateful for the support we have received. Thanks to all and may you have a very HAPPY NEW YEAR. We would like to thank everyone who has helped us to support the Arts in our community in 2013. It has been a big year for AmadorArts! Our Arts in Education program is growing. This year we added a new class to our Artists in the Classroom series. Now, 5th graders in Amador County have a Chalk Pastel class with Bruce Peccianti in addition to 4th grade watercolor, 3rd grade paper collage, and school-wide performances by the B Street Theatre. We are also collaborating with the Amador County Recreation Agency on an after-school arts program for 5th, 6th, 7th & 8th graders. In 2013, well over 1,000 Amador County students participated in one of our Arts Education Opportunities. 2013 was our 15th year of TGIF Free Summer Concerts. Featuring a lineup of local favorites and new regional bands performing in parks and venues throughout the county, TGIF continues to be a summer staple of Amador County. 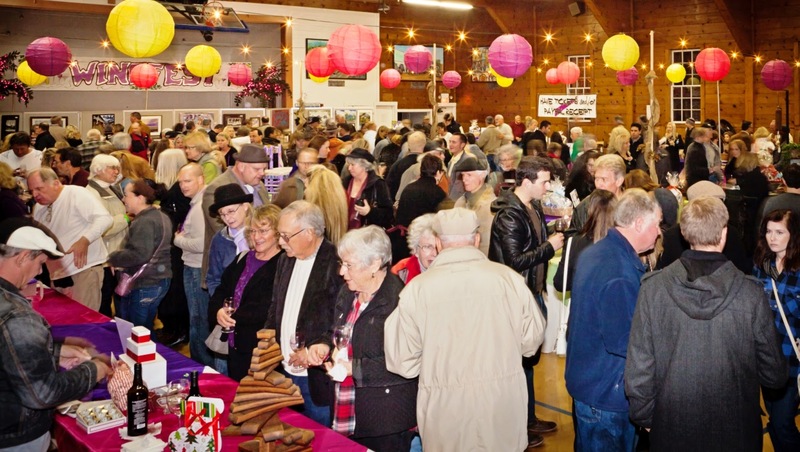 The 16th annual Winefest on November 9th, 2013, was one of our largest events ever, with more than 800 attendees from our area and beyond! This year, AmadorArts awarded two $1,000 scholarships to graduating high school seniors pursuing higher education in the Arts. We also contributed to a number of local schools, PTOs and organizations for arts-based projects within our community. We are proud to continue supporting, promoting and encouraging the Arts in our Schools and Community. In 2014, we expect to see our programs and events grow even more. To make this happen, we can use your support now more than ever! You will be receiving our membership renewal letter over the holidays. If you would like to get a jump on supporting the Arts, and take your tax deduction for 2013, please feel free to renew your membership on our website www.amadorarts.org, or complete the attached form and mail it back to PO Box 206, Sutter Creek, Ca 95685. With our Wishes for a Merry Christmas and a Very Happy New Year! Another type of artwork Stromme produces is what he calls art trading cards. These 2.5 x 3.5-inch abstracts were previously painted on card stock, but he has recently switched to mat board. Some of these cards come mounted on paper and can be framed for display. Curtis Stromme is a member of the Amador County ArtistsAssociation and currently sits on its board. Sutter Creek Gallery invites you to spend some time with the artist at a reception on Saturday, January 4, from 4 p.m. to 7 p.m., as part of the region’s First Saturday Art Trek. 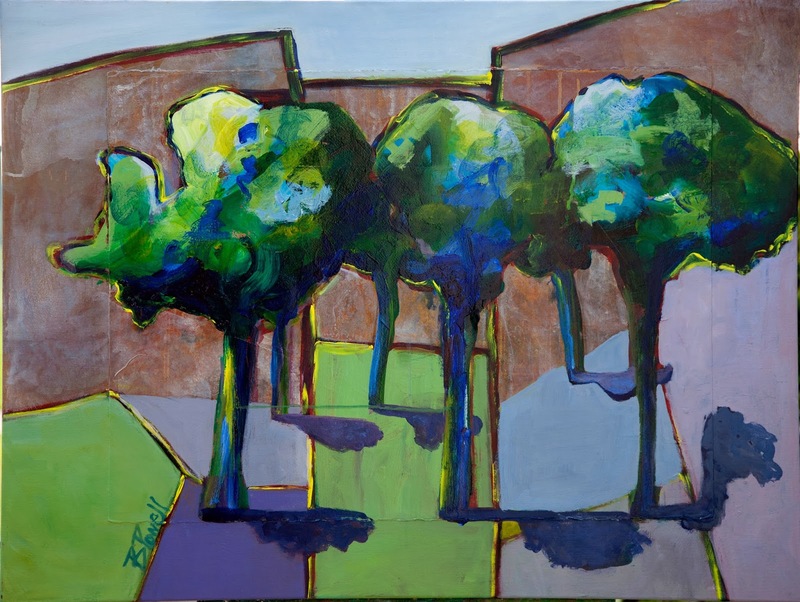 Stromme is one of 30 local artists exhibiting at the gallery located in the heart of Sutter Creek at 35 Main Street. The gallery is open Sunday, Monday, Wednesday and Thursday from 10 a.m. to 5 p.m., Friday and Saturday 10 a.m. to 6 p.m. For additional information, call 209-267-0228 or email suttercreekgallery@gmail.com. Preparation: In the audition, all students will be taught a short musical theater and/or jazz combination. Students will then be divided into small groups to perform the combination for a panel off our judges. For those who are tap dancers, an additional combination will be taught and performed. Those who audition are also expected to prepare 15 seconds of any additional talent they wish to share with the judges (singing, acrobatics, drama, dance, etc.). While formal dance attire is not required, please wear semi-fitted clothing that you can move freely in. Long hair must be pulled back away from the face. Jazz shoes are recommended, but if you do not have any, please wear light weight tennis shoes (no black rubber soles). The tradition of raising funds to support residents with disabilities goes deep in Amador and Calaveras County. 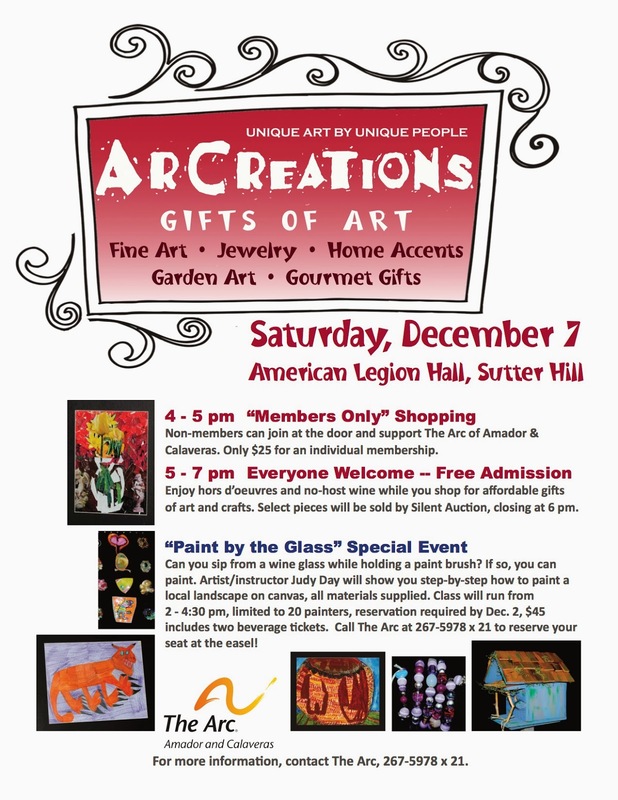 Saturday, December 7, 2013 repeats a tradition over 40 years in the making as The Arc hosts its annual fundraiser at the American Legion Hall in Sutter Hill while highlighting local Artists in ArCreations! The event raises money for programs and services provided to adults with disabilities. Local business, Terra d’Oro Winery, will highlight the amazing annual ArCreations! event by being one of the title sponsors supporting The Arc of Amador and Calaveras, pouring their local wine. ArCreations! is one of the many creative attractions of The Arc’s programs. Unique gifts of arts and crafts created by unique people will be featured and on sale at the 2013 ArCreations! 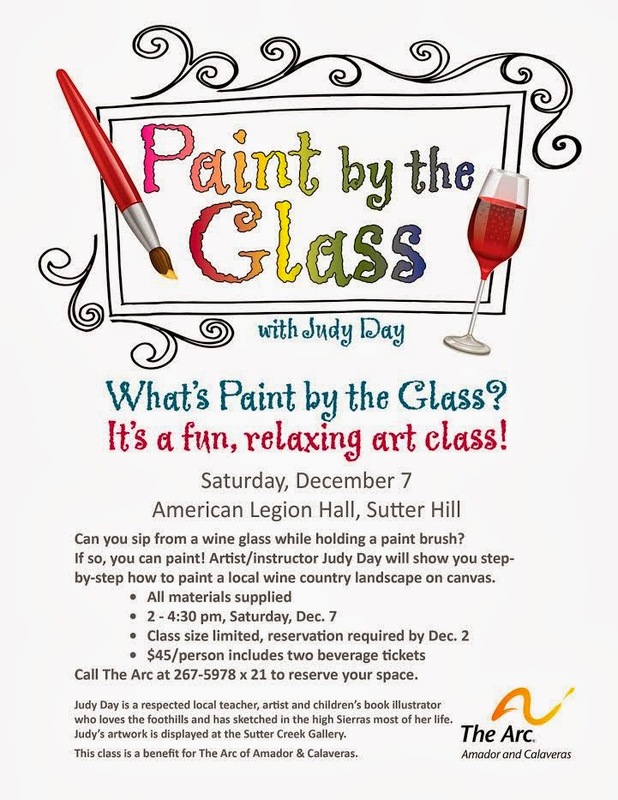 event, Saturday, December 7 at the American Legion Hall in Sutter Hill. To draw attention to the rich culture of local artists there will be “Paint by the Glass”. 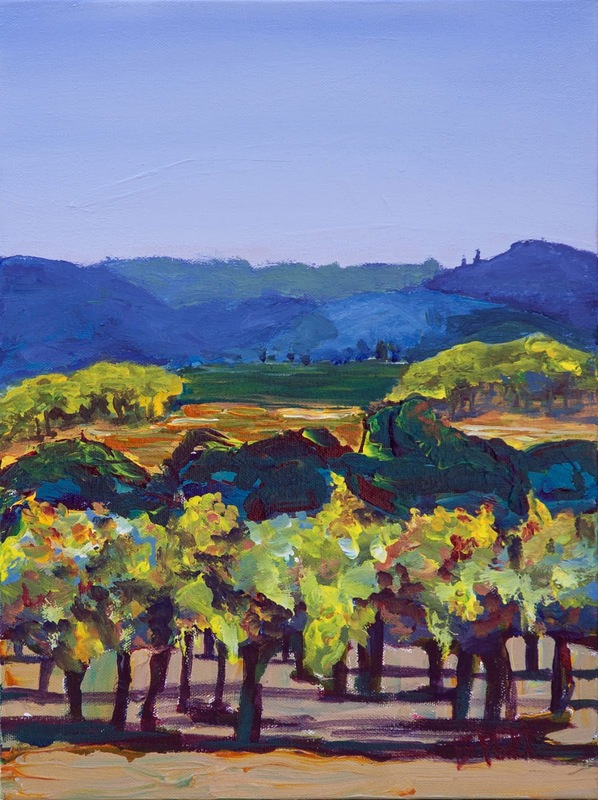 A creative way to learn to paint alongside friends and family, while artist/instructor Judy Day shows step-by-step how to paint a local wine country landscape on canvas, and painters enjoy local wines and hors d’oeuvres at a “Paint by the Glass” workshop. The tax deductible ticket for the class is $45 and includes two beverage tickets for wine, canvas and art supplies. Don’t forget to register and reserve your easel. ArCreations! is FREE and everyone is welcome to enjoy hors d’oeuvres and no-host wine while they view and shop for affordable gifts of art and crafts, beginning at 5 pm. Select pieces will be sold by silent auction, closing at 6 pm. Members of The Arc are invited to the popular hour of “early bird” shopping from 4 – 5 pm (non-members can join at the door and support The Arc with a $25 individual membership). ArCreations! is a unique arts education program developed by The Arc of Amador and Calaveras to enhance self-esteem and expression in the people served by The Arc, a local non-profit organization serving people with intellectual and developmental disabilities in the two counties. Proceeds from ArCreations! go to the individual artists and to a fund that supports the ArCreations! program at The Arc. For more information about ArCreations! and The Arc, visit www.arcofamador.org or call The Arc at (209) 267-5978. 1st Saturday Art Trek for December 7 will Feature a New Set of Artists Whose Works Can Be Seen for the Entire Month of December. Notable for your free gallery-hopping fun on December 7th is that many galleries are having special holiday exhibits, such as the Hanford St. Gallery, the AmadorArts Gallery, the Fine Eye Gallery and at the Little City Studio and Gallery. Little City Studio & Gallery - A kaleidoscope of lovely handmade artsy gifts. Jewelry, scarves, artwork, woven goods, textile art, pottery, craft items, cards - all colorfully displayed in our beautiful old brick shop. Consignment clothing as well, for your sartorial splendor! Everything at very reasonable prices. Fine Eye Gallery –“Gather ‘Round” - The holiday season is celebrated here with a selection of hand-made platters, plates and cups from California-based ceramic artists. Mary Camin and Margaret Grisz-Dow have each created a collection for the Fine Eye with graceful, garden-themed designs while Suki Diamond’s works feature jaunty animals. Ross Spangler, Kim McCarthy and Thomas Post have contributed colorful graphic forms. Bonnie Belt’s equestrian and floral motifs punctuate her ultra-functional wares. Cheryl Constantini is known for her work that blends the traditions of Asian pottery with contemporary flair. Also featured are the oil paintings of Ashland, OR artist, Linda Lamore. Gallery Hours: 10:30am – 5:30pm Daily. Fine Eye Holiday Open House: December 6 & 7, 2013. 71 Main St., Sutter Creek, CA 95685 www.fineeye.com or call 209-267-0571. Petroglyphe Gallery - Celebrate the Spirit of the Season at the Annual Christmas Reception on Sunday, December 15th from 5:00 to 8:00 pm when the works of over 27 artists will be illuminated by a festive holiday atmosphere. Enjoy wine and light appetizers as you discover the wide range of art to inspire your gift-giving. Visit with many of the gallery’s artists and listen to the live music of guitarist Herb Boxhorn and saxophonist Klaudia Promessi while embracing the warmth of small town Christmas spirit.... Hours: Thurs – Sat 11:30am – 5:30pm, Sunday 11:30am – 4:00pm. 8317 Main St., Mokelumne Hill, CA 95245. www.gallerypetroglyphe.com or call 209-286-1387. 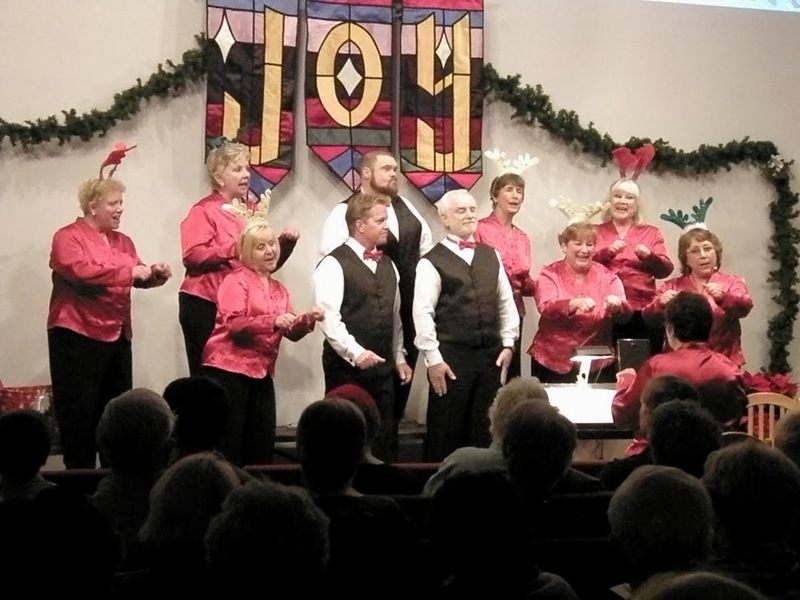 A 34–member choir and 17-piece orchestra will offer a special musical Christmas story presentation, “The Heart of Christmas”, to be performed in three separate locations the weekend of December 21 and 22. The first performance will be at St. Katherine Drexel Catholic Parish, 11361 Prospect Drive, Martell on Saturday, December 21 at 1pm. 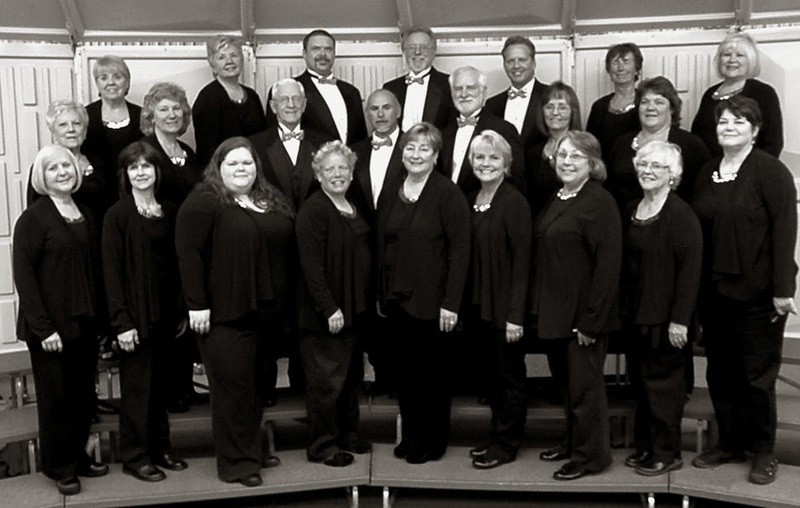 On Sunday, December 22, the second performance will be held at Faith Lutheran Church, 22601 Hwy 88, Pioneer at 10:30am. The third and last presentation will be Sunday December 22 at 3pm at the Ione United Methodist Church, 150 W. Marlette St, Ione. This one-hour musical program will feature music that will engage and please all ages, including eight original songs by composer/ arranger Pepper Choplin, with orchestra scoring by Michael Lawrence. 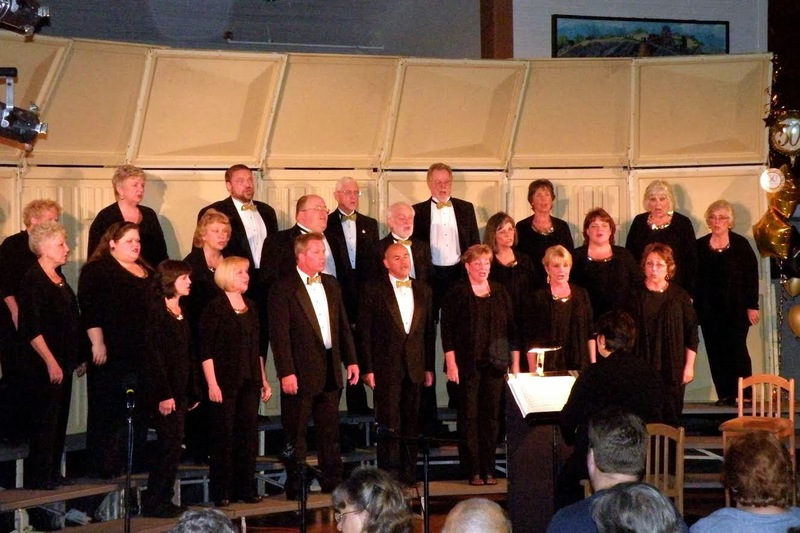 Performing the cantata this year will be a 51-member community choir and orchestra, led by Amador County Concert Band director Stephen Chambers of Pioneer. Whether it is peace on earth, snow on the ground or a special toy from Santa, the holiday season brings forth many Christmas Wishes. The men and women of the Amador Choraliers will put those wishes to song with their 51st Christmas concert series, “Christmas Wishes”. The hope for peace on earth can be heard in classics like “O Holy Night” & “ The First Noel” while “White Christmas’ & “Sleigh Ride” will bring up memories of fun in the snow. And who doesn’t want something new under the tree on Christmas morning? Are you hoping for “A Hippopotamus for Christmas”? Or maybe just “A Perfect Christmas Night”. Whatever your wish, you can find it in song with the Amador Choraliers. The concert series kicks off at 7:30 pm on Dec. 12th at the Cornerstone Church in Ione, then continues at the beautiful St. Katherine Drexel Catholic Center in Martell on Dec. 14th, at 7:30 pm and Dec. 15th at 3:00 pm. Tickets are just $10.00 and can be purchased at the Amador County Chamber of Commerce on Main Street in Jackson or call 223-0350 to purchase by credit card. Additional tickets may be purchased at the door on a first come, first served basis. Doors open one half hour before concert time. Join us for this holiday tradition and let the Amador Choraliers fulfill a few of your “Christmas Wishes”! For more information call Carole at 743-9258. The Gallery of AmadorArts in Sutter Creek will be featuring during the month of December “Unique Jewelry” by eight local artists. Just in time for holiday gift-giving, the show and jewelry sale opens for the 1st Saturday Art Trek on December 7th and will run until the end of December. All work will be between $25 and $99; some even a bit less! One commonality of the artists is the enjoyment of experimenting with different materials and then, developing their own flair. Be sure to stop by the gallery at 11-A Randolph Street any day but Wednesday -- for this Holiday Show the gallery will be open Sundays --to see the displays of these artists: Karen Crane, Roberta Hughes, Donna Lynn Keever, Kathy Martinez, Gayle Mayhew, Marie Martz-Mort, Edie Schembri, and Carolene Wiser. Karen Crane keeps a large collection of natural crystals and stones, shells and beads that provides a rich palette and allows her to choose colors like an artist. Since 1999, she has developed a unique technique using wire, stones and beads to make colorful pendants, rings and bracelets. Her style continues to evolve, usually in response to special requests from collectors. She sells from her studio in Jackson, at local shows, and on the internet. 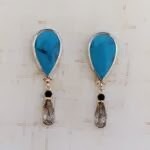 Roberta Hughes created a business called Berta's Beautiful Beads and she handcrafts quality costume jewelry in her Sutter Creek workshop, using sterling silver and 14K gold components, as well as Austrian crystal and natural stone beads. She also sells successfully at many jewelry shows throughout California. 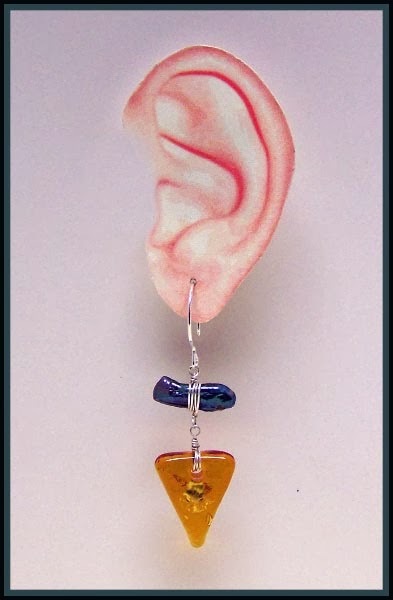 Donna Lynn Keever opened an art glass business in 1969 in Marin County and later experimented in dichroic glass which has become a hallmark of her jewelry and which she has sold at art shows for 30 years. Hundreds of different colors and textures are fired in her “hot glass” dichroic-coated earrings, bracelets and pendants. 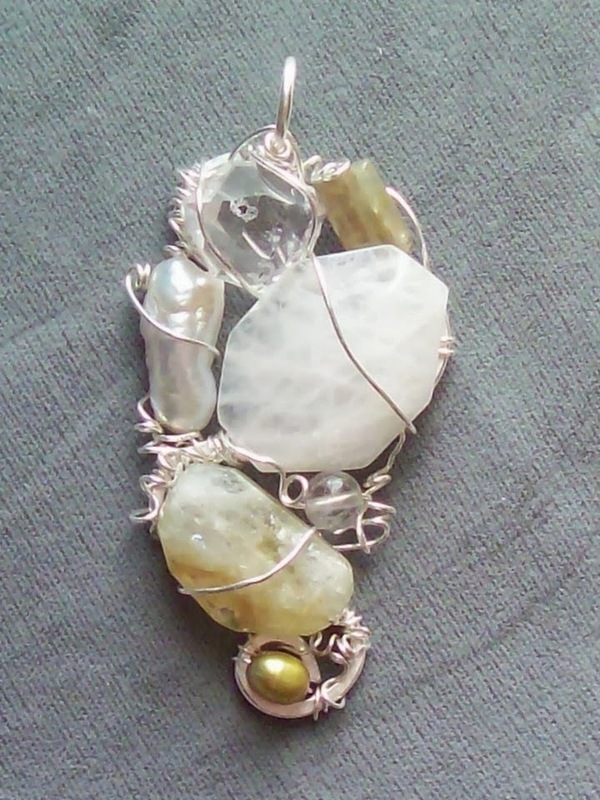 She also works in bronze clay and makes raku beads to create another style of jewelry. Kathy Martinez, member of what is commonly called the Pit River Tribe, started making and selling California Indian style items in 1996, because she noticed many of the of the pow wows and conferences had very little Native California Indian representation. She also wanted to let the world know that California Native People still lived. Her jewelry is mainly contemporary in style and contains Abalone, Pine Nuts, Dentalium and Bear Grass. She belongs to the Motherlode Storytelling Guild and the Storytelling Association of California. Gayle Mayhew lives and works by the slogan, “If it’s not fun, what’s the point? !” She loves the vast colors and textures of stone shards , stick pearls, and the magic that happens when she combines them along with the glass that she makes. You can find her at an Art Show somewhere in Northern California most weekends during the spring and summer. For the AmadorArts show, Lampwork glass heart necklaces will be featured along with pearl and semi precious gemstone earrings and necklaces. Marie Martz-Mort has worked with several custom jewelers in her nearly 30 years as a bench jeweler specializing in fabrication and design. She also creates using the lost-wax casting technique, hand engraving and resetting and repairs of jewelry. As one of the member-woners of Gallery 10, she regularly exhibits there. Edie Schembri is known as “ediebeady.” She started doing beadwork during the beatnik era in New York and has been designing “outside of the box” for over 50 years. Her new love is working with copper, brass and other metals. She enjoys sharing her knowledge with young people in elementary Schools, AmadorArts after School Program at the HUB, and with the Blue Mountain Coalition for Youth and Families. Carolene Wiser is a long-time Amador County artist living at a remote setting near Volcano. For the past 15 years, Wiser has been designing pieces that are one-of-a-kind jewelry creations and include materials of gemstones, natural minerals, imported beads and focal pieces, ethnic charms, and mystical totems. AmadorArts Gallery is located one block off Main St., at 11-A Randolph St., adjacent to the historic Monteverde General Store Museum. Attempted hours of AmadorArts gallery are 9-2, Monday, Tuesday, Thurs., Fri. an Saturdays and Sundays, from 1-4 pm. Best to call first 209- 267-9038. Visit www.amadorarts.org for all the galleries participating in 1st Saturday Art Treks. Unique gifts of arts and crafts created by unique people will be featured at the 2013 ArCreations! event, Saturday, December 7 at the American Legion Hall in Sutter Hill. Fine art, jewelry, home accents, garden art and gourmet gifts have been created by people with intellectual and developmental disabilities at The Arc of Amador and Calaveras. Each artist explores and develops their own personal creativity, empowering them to exhibit and sell art. ArCreations! is free and everyone is welcome to enjoy hors d’oeuvres and no-host wine while they shop for affordable gifts of art and crafts, beginning at 5 pm. Select pieces will be sold by silent auction, closing at 6 pm. ArCreations! is a unique arts education program developed by The Arc of Amador and Calaveras to enhance self-esteem and expression in the people served by The Arc, a local non-profit organization serving people with intellectual and developmental disabililties in the two counties. For more information about ArCreations! and The Arc, visit www.arcofamador.org or call The Arc at 267-5978. Bright colors and heavy textures are the building blocks of Bobbie Powell’s art. She creates using oils, acrylics, inks, watercolor and collage to produce vibrant landscapes, still lifes, and figurative narratives. This multifaceted and award-winning artist will be featured at Sutter Creek Gallery for the month of November. Powell tells stories with her art. One day she may decide to interpret something from the newspaper and the next day she may be overtaken by inspiration in her garden. Visit her blog, www.dailyartbeast.blogspot.com, where she shares her thoughts and art process. This self-taught artist has learned from some of the best artist-instructors in Placer and Sacramento counties. She has also attended the nationally famous Intensive Studies Seminars in Taos, New Mexico. In addition to showing her work at the Sutter Creek Gallery, Powell is represented by Patris’ Art Gallery and Studio in Sacramento. Hanford St Gallery presents four fabric artists for the month of November. Each brings a unique vision and highly evolved technique that will expand your understanding of what can be accomplished in the medium. Sacramento artist Merle Axelrad works with fabric to produce landscapes of stunning color and texture. Working from composite photographs and sketches, she spends hundreds of hours on each individual image, transforming what has been regarded as a traditional craft into a serious art form through the application of a technique she’s perfected over many years. Living and working in the San Francisco Bay Area Joan Schulze paints, prints images directly onto cloth, uses glue transfer processes and collage techniques. Her main theme is often surreal compositions combining found and personal images, contrasting beautiful colors with eccentric surfaces. In her artwork the element of surprise in theme and execution has been noted by many critics. Alice Beasley has been making fabric paintings in the San Francisco Bay Area since 1988. She uses the ordinary quilter’s tools of commercial fabric and thread to make portraits and vibrant still life compositions. Rather than relying upon templates or photo projections, she prefers to work directly, building a composition in the same manner as a painter working on a canvas. All pieces are cut free-hand from fabric with scissors or rotary cutter, fused and machine appliquéd. Sandra Poteet came to fabric art in 2002. Her dramatically textured pieces are, sometimes purely abstract or just as often abstracted scenery. The blocks of color are reminiscent of paint applied heavily with a palette knife. Sandra lives and works in the Grass Valley/Nevada City area. Courtesy of Victorian Closet in Amador City and by way of contrast we will be showing samples of lacework from centuries past when a woman's art was confined to the home and her own adornment. To further expand your Fiber Arts experience in November our friends at the Sutter Creek Gallery will be featuring needlepoint work by Angie Olmstead and Little City Studio in Amador City will have Carol Sethre's hand woven creations - rugs, shawls, scarves - produced in the gallery. In addition a group of Textile Association Artists are featured at the Shenandoah Vineyards Art Gallery "Fall Fiber Art Show" through Jan 2014. Opening October 31 the Hanford St. Gallery show will run through November 24. There will be a reception for the artists on Saturday Nov. 2nd from 4 to 7pm as part of the Amador Art Trek. 1st Saturday Art Trek for November 2 will Feature a New Set of Artists Whose Works Can Be Seen for the Entire Month of November. Notable for your free gallery-hopping fun on November 2nd is that three galleries will be focused on the fibre arts. That would be at the Hanford St. Gallery, the Sutter Creek Gallery, and at the Little City Studio and Gallery. In addition a group of Textile Association Artists are featured at the Shenandoah Vineyards Art Gallery "Fall Fiber Art Show." Other galleries will have photography by David and Leslie Schupp in AmadorArts Gallery; Painters Annie Hughes in Gallery 10; and Pam Findleton and Dale Laitinen in Moke Hill’s Petroglyphe Gallery. Hanford St. Gallery - “Painting in Fabric “- Four fabric artists, each bringing a unique vision and highly evolved technique of what can be accomplished in fabric. For example, Merle Axelrad works from composite photographs and sketches to produce fabric landscapes of stunning color and texture. Joan Schulze alters purchased fabrics by dyeing, painting, Xerox transfer, photography and digital technology. Alice Beasley cuts free-hand from fabric with scissors or rotary cutter, fused and machine appliquéd. Sandra Peteet creates dramatically textured pieces, sometimes purely abstract or abstracted scenery. The blocks of color are reminiscent of paint applied heavily with a palette knife. Opening October 31st the “Painting in Fabric” show will run through Nov. 24. There will be a reception for the artists on Nov. 2nd from 4 to 7pm as part of the Amador 1st Saturday Art Trek. 291 Hanford St. (old Highway 49), Sutter Creek, CA 95685. Gallery is open Thursday thru Sunday from 11am to 5pm.www.hanfordstgallery.com; 209-267-8074. Petroglyphe Gallery - “Personal Petroglyphs: Two Painters’ Journey in the Desert Southwest” A show of over 40 recent works by Pam Findleton and Dale Laitinen. Both artists were recently inspired by their travels through the landscapes of the American Southwest. Through works that capture the spectacular plays of light and shadow, Findleton and Laitinen’s new paintings convey a connection to an ancient timeless landscape. The exhibit ends Nov. 10. Hours” Thurs – Sat 11:30am – 5:30pm, Sunday 11:30am – 4:00pm. 8317 Main St., Mokelumne Hill, CA 95245. www.gallerypetroglyphe.com or call 209-286-1387. Gallery 10 Annie Hughes - An exhibit of works that reflect her life spent teaching in Laos. Her style is carefree and happy with her subjects of village life, people, Buddhism and more. There’s a unique story that goes with each work. Meet Annie at the Art Trek reception Saturday, Nov. 2 between 2 and 4 pm. at Gallery 10, 15 Eureka Street in Sutter Creek. The show continues through November. Gallery is open Thursday through Monday from 11:00 - 5:00 p.m. www.gallery10suttercreek.com. 209-267-0203. Sutter Creek Gallery - Needlepoint Tapestry Artist Anje Olmstead - She has worked as a needlepoint designer for well-known needle art companies for over 40 years. 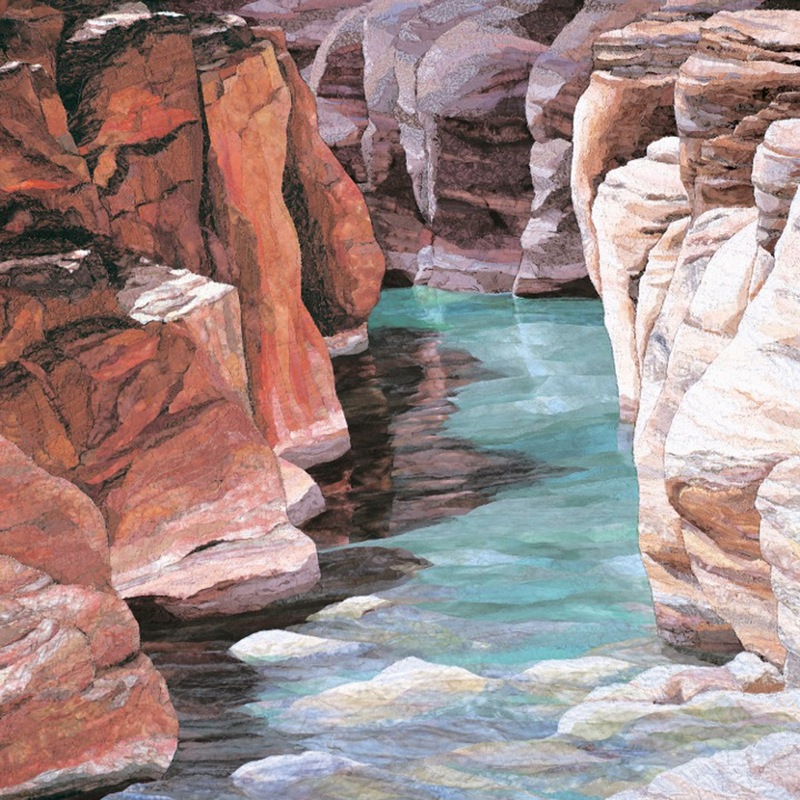 Her current needlepoint tapestry work is adapted both from her own photographs and watercolors created while on road trips. Spend some time with the artist at a reception on Saturday, Nov. 2nd , from 4 p.m. to 7 p.m., as part of the First Saturday Art Trek. 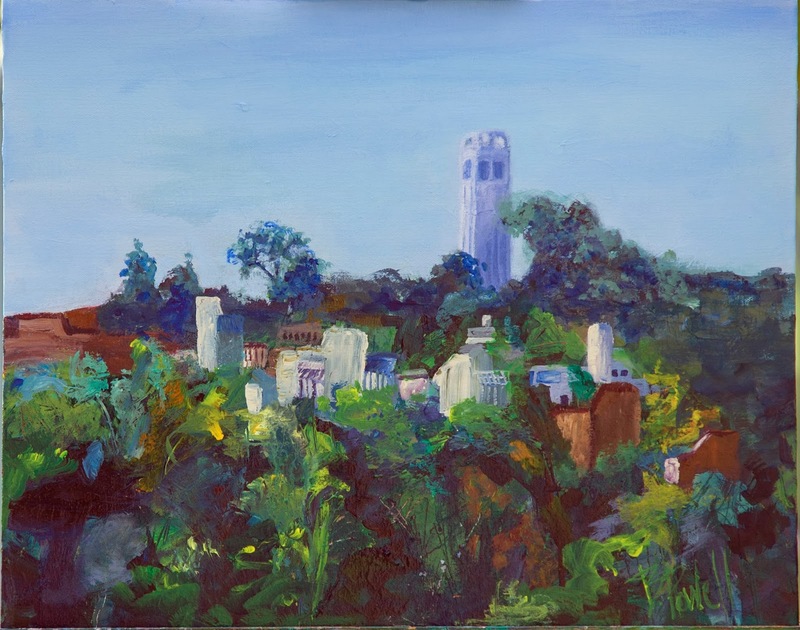 Olmstead is one of 30 artists exhibiting at the gallery located in the heart of Sutter Creek at 35 Main Street The ours are Wednesday and Thursday 11 a.m. to 5 p.m., Friday and Saturday 10 a.m. to 6 p.m. and Sunday 10 a.m. to 5 p.m. For additional information, call 209-267-0228 or email suttercreekgallery@gmail.com. Fine Eye Gallery – “Gather ‘Round” – Starting Nov. 9, Fine Eye kicks off the holiday season with a selection of hand-made platters, plates and cups from California-based ceramic artists, benefiting the Interfaith Food Bank of Amador County. Mary Camin and Margaret Grisz-Dow have each created a collection for the Fine Eye with graceful, garden-themed designs while Suki Diamond’s works feature jaunty animals. Ross Spangler, Kim McCarthy and Thomas Post have contributed colorful graphic forms. Bonnie Belt’s equestrian and floral motifs punctuate her ultra-functional wares. Cheryl Constantini is known for her work that blends the traditions of Asian pottery with contemporary flair. Also featured are the oil paintings of Ashland, OR artist, Linda Lamore. Exhibit runs Nov. 9 – Dec. 31, 2013. Gallery Hours: 10:30am – 5:30pm Daily. Fine Eye Holiday Open House: December 6 & 7, 2013. 71 Main St., Sutter Creek, CA 95685 www.fineeye.com or call 209-267-0571. Trial by Jury, comic operetta by W. S. Gilbert and Arthur Sullivan Sunday, November 24, 3 pm at the Sutter Creek Theatre, 44 Main Street, Sutter Creek. Fully costumed and staged production performed by the Opera Workshop Program, California State University-Stanislaus. Directed by Joseph Wiggett, Artistic Director of the Townsend Opera Players. $20 adults, $10 children under 18. Tickets may be purchased at Mother Lode Music, Prospect Plaza, Martell, Calaveras Arts Council, Main Street, San Andreas, and at the door. Consult www.mlfm.org or call 209-293-4227 for more information.